Once more I am permitted to breath the pure Southern air of Va and to write you that I am have made the trip to Mary Land and am now well, though many from our Regt are lying under the sod of Mary Land cold in death. I suppose you have ere this heard of the fight we had over the River, in my opinion one of the hardest fought battles that we have had in this army. We had 8 wounded in our company, One mortally wounded H. Turner now dead, and only two dangerously Reese Houston and Rufe Shaw-I imagine with what sorrow the news will reach uncle Wms family- just after losing one son. Rufe is badly wounded, but I do not think his wound is mortal, and the doctor thinks with the proper attention he will recover, the ball entered the left shoulder and came lodged just under the skin and under the shoulder blade. I am in hopes he will soon get home, where he will be properly attended to. To learn more about Civil War history in Frederick County, click image of Confederate troops marching West on East Patrick Street, September 12, 1862. 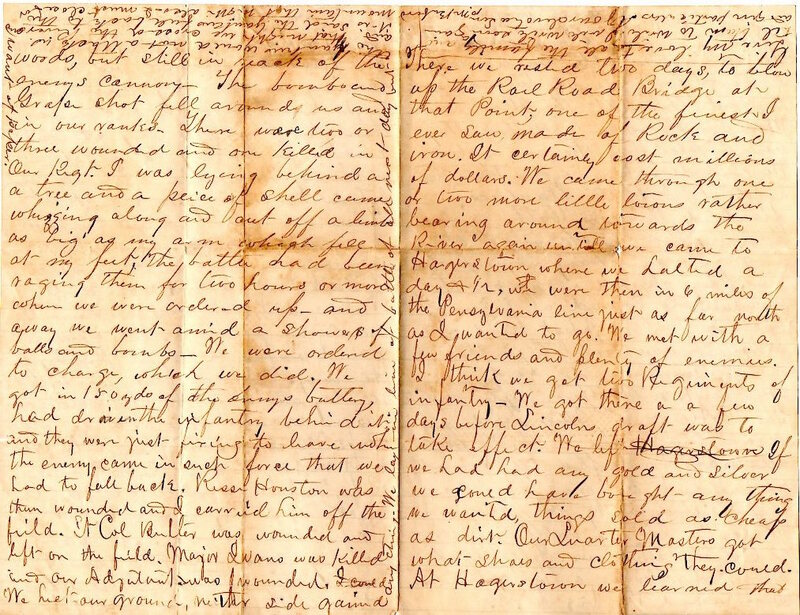 I wrote to you the day before we crossed the Potomac, which letter I hope you rcd. I will now give you a brief sketch of our trip into Mary Land. We crossed the River and went near Leesburg and went about 25 miles to Frederick city on the Baltimore and Ohio River Rail Road. There we rested two days, to blow up the Rail Road Bridge at that Point, one of the finest I ever saw, made of Rock and iron. It certainly cost millions of dollars. We came through one or two more little towns rather bearing around towards the River again untill we came to Hagerstown where we halted a day + 1/2, wh were then in 6 miles of the Pensylvania line just as far north as I wanted to go. We met with a few friends and plenty of enemies. I think we got two Regiments of infantry- We got there a a few days before Lincolns draft was to take effect. We left Hagerstown If we had had any gold and silver we could have bought any thing we wanted, things sold as cheap as dirt. Our Quarter Masters got what shoes and clothing they could. At Hagerstown we learned that the enemy was after un us with a large force, so we turned back to meet them at the Mountain. When our Division got there they were fighting in the mountain We had two Brigades there to hold it, but the Yankees flanked them on both sides driving them back and killing a great many. taking some prisoners. They carried us up on the mountain and formed a line of batteries in the roughest kind of a place, it was then late in the evening. Our Brigade had a skirmish with them after nights. The 4th Ala + 2nd Miss fired several rounds, and the balls flew all as and bombs flew all around us, but hurt no one. There was a few killed in the other Regiment. We lay in line of balls under 12 O clock when we fell back about 4 miles to a better position where we had the big fight. The Yankees followed us next morning untill they came in sight, and then both sides lay there all day grinning at one another, preparing to fight next day. We had a little skirmish late in the evening. in which Lt Nelms was wounded and Graham of our company. Col Liddell was mortally wounded with a piece of shell. The ball that wounded Nelms did not miss me 3 in- We were lying down in the open ground exposed to a battery of the enemy. We had been in front all day and after the skirmish was over we we were relieved by other troops. We drew some flour and salt that night and Tub Buford and Rufe Mitchel were detailed to coock it,- so they did not get into the fight next day. As soon as day dawned the enemy made the attack. We were then in the rear in a skirt of woods, but still in mack of the enemys cannon- The bombs and Grape shot fell around us and in our ranks. There were two or three wounded and one killed in Our Regt. I was lying behind a a tree and a piece of shell came whizzing along and cut off a limb as big as my arm which fell at my feet, the battle had been raging then for two hours or more when we were ordered up- and away we went amid a showers of balls and bombs- We were ordered to charge, which we did. We got in 150 yds of the enemys battery, had driven the infantry behind it and they were just fixing to leave when the enemy came in such force that we had to fall back. Click image to view animated map of the Battle of Antietam. 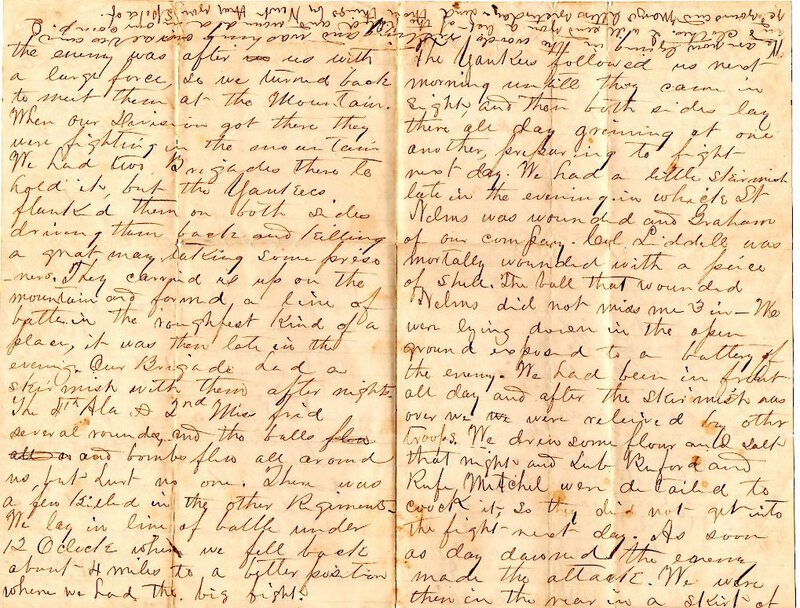 This letter was written near Martinsburg, Virginia. Little did Parham know that by year’s end, efforts would be made to snuff-out the “pure Southern air of Virginia” from Martinsburg. An application would be made to Congress on December 31, 1862 for the admission of the Western region of Virginia to the Union. Martinsburg would soon lie within the new state of West Virginia, the only state formed through secession from the Confederacy. Parham was engaged in the following two battles during the Maryland Campaign since the previous posted letter: Boonsborogh, Sharspburg (also known as Antietam). A History of Company G, Eleventh Mississippi Regiment, C.S.A. documents information about comrades mentioned by Parham. Hezekiah (H) Turner present at Boonsborough, where he was killed on the last day of the battle of Sharpsburg. Rees A. Houston present at Sharpsburg, where he was severely wounded. Rufus A. Shaw, Parham’s cousin, present at Boonsborough, Sharpsburg, where he was severely wounded and brought back to Shepherdstown, Va. He was retired July, 1864 by reason of wound through left lung. Is the wound described by Parham (i.e. ball entered the left shoulder and came lodged just under the skin and under the shoulder blade) also what resulted in damage to the lung? Although eventually retiring almost two years later, Rufus is not cited as having served in any battles following Sharspburg. William G. Nelms, a 2nd Lt. whom Parham wrote of as being hit by a ball which narrowly missed him, was present at Seven Pines, where he was wounded; at Gaines’s Farm, where he was again severely wounded. He was at Boonsborough and at Sharpsburg, when he was again wounded. The second day at Sharpsburg he was more severely wounded. He was present again at Gettysburg, when he was again severely wounded. First day on Weldon Railroad he was wounded and on the second day he was again severely wounded; at Hawkes Farm he was again severely wounded on 25th of March, 1865, and was sent to hospital at Richmond, where he suffered for several months. Finally he recovered and returned to Mississippi…He made a fine soldier, always ready for duty when not disabled…His record speaks more eloquently than any other words of ours, his devotion and service to the cause so dear to every true Southron, for it tells of the many scars which he bore upon his person, relics of the noble struggle he made for his country. We trust that his brave spirit now rests in the peace which is eternal, and that he will meet his comrades in that reunion which shall have no end. James H. Graham present at Boonsborough, Sharpsburg, where he was wounded on the second day of that battle…battle of the Wilderness, where he was again wounded on the second day…at Bethsaida Church, two days, and was no more with the company because of sickness. Goodloe (Tub) W. Buford, Parham’s cousin, whom Parham wrote of as being on cooking duty was at Boonsborough, Wilderness, where he was wounded in the head…Hatcher’s Run, where he was again severely wounded in the hip. Rufus N. Mitchell whom Parham wrote of as being on cooking duty was previously wounded at Seven Pines, and was absent on wounded furlough until the Battle of Boonsborough, and was present in every battle thereafter till close of the war except Hatcher’s Run, where he was on furlough. Other individuals from the Regimental Staff mentioned by Parham are as follows. Phillip Franklin Liddell, Lt. Col. died from wounds received at Sharpsburg. Samuel F. Butler, Lt. Col. died from wounds received at Sharpsburg. Taliaferro Sidney Evans, Major was killed at Sharpsburg. 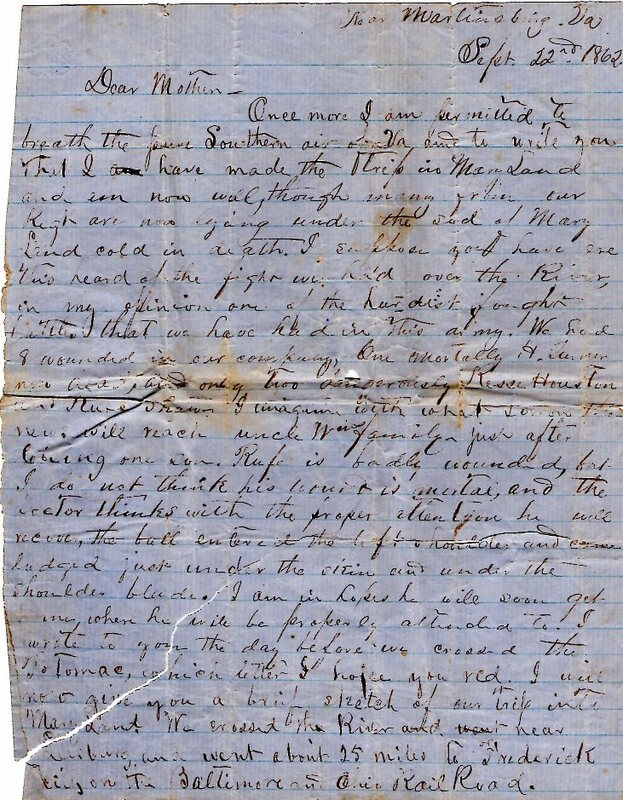 This entry was posted in Parham Buford, Sept 1862 and tagged Goodloe Buford, Hezekiah Turner, James Graham, Lt. Col. Phillip Franklin Liddell, Lt. Col. Samuel F. Butler, Major Taliaferro Sidney Evans, Martinsburg, potomac, Rees Houston, Rufus Mitchell, Rufus Shaw, Sharpsburg, Tubby Buford, William Nelms.